Everyone at Trendy Twine wanted to with you a Happy Easter! We all made fun projects for you. You can see all of them over at Twine It Up! with Trendy Twine. 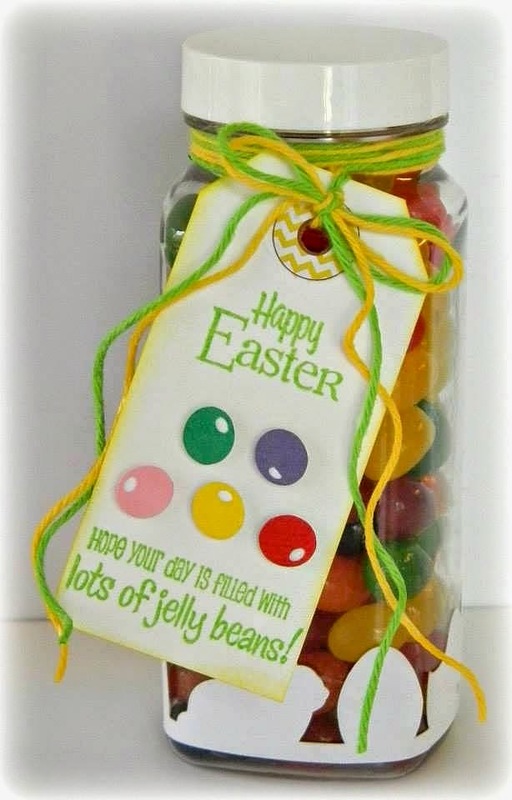 I made a fun and easy treat container full of Starburst Jelly Beans -- the best ones :) The Milk Bottle, Tag, Circle Reinforcement, and of course, the fabulous twine can be found over at Annie's Paper Boutique. I used some Scotch Quick Dry Glue on the twine strand to make them a bit curly. Just wet the strands with glue and wind around a pen or something round--let dry and your twine will be curly! Please stop by Twine It Up! with Trendy Twine to see all the fun projects, and have a Happy Easter! Awesome job on your treat jar!! I love the fun colors you used and your border! Happy Easter! Super adorable way to decorate the milk bottle Helen! Love your CUTE tag too!! Such a sweet treat!!! Love the funs sentiment!! Love jelly beans. Your milk bottle full of jellys looks so awesome, love the border at the bottom! Have a happy Easter! Such a sweet treat jar, Helen. Love your cute border and that darling tag. Thanks so much for doing this special post for Easter.